You may receive updates from Machinists Union and AFL-CIO, the sponsors of this letter campaign. U.S. Rep. Donald Norcross (D-NJ) just introduced the Fairness for Federal Contractors Act of 2019 (H.R. 824), legislation that would provide back pay for federal contract workers affected by the recent federal government shutdown. More than one million federal contract workers lost a month of paychecks during the longest government shutdown in history and now they should receive the back pay they deserve. This legislation would ensure back pay is granted up to a maximum of $1,400 a week. Fill out the form on the right to be connected to your member of Congress. 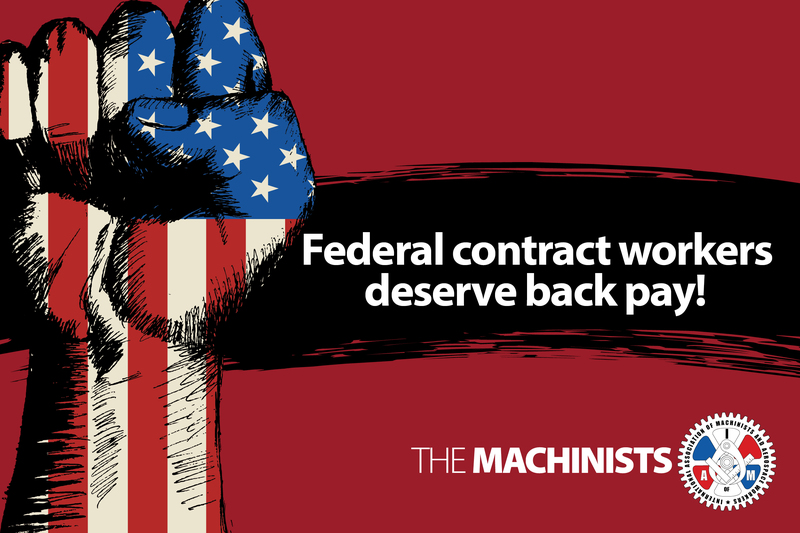 Urge them to co-sponsor the Fairness for Federal Contractors Act of 2019. Read this letter from IAM International President Robert Martinez Jr. to members of Congress urging them to co-sponsor the Fairness for Federal Contractors Act.